Farming Simulator 2013 is the next installment in an entertaining game franchise dedicated to show you the delights of country life, as well as agriculture and small-scale farming. In Farming Simulator 2013, you take on the role of a farmer with a mission: to take advantage of the land and animals located on a farm in order to make money and expand production. You are given access to the newest technology in planting and harvesting, and the chance to use well over 100 different farming vehicles and machinery. Some of the things you may have to overcome in Farming Simulator 2013 are environmental variables and even the possibility of crops going terribly wrong. Farming Simulator 2013 1.0.0.1 is a shareware program and can be used as a demo to try the software until the free trial period has ended. A full version of the program is available after the trial period ends. For security reasons, you should also check out the Farming Simulator 2013 download at LO4D.com which includes virus and malware tests. Additional screenshots of this application download may be available, too. Farming Simulator 2013 has a presence on social networks. 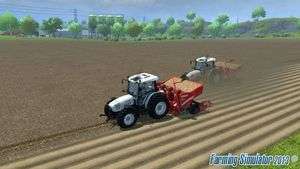 Farming Simulator 2013 download been highly rated by our users.